When we got to Austin in the evening, I took a cab downtown to meet up with a high school friend, and Carolyn went to bed. The next day, with a couple hours to act like tourists, Carolyn and I went out to lunch and browsed a few funky stores (Austin has a lot of funky stores). Then she returned to the hotel to take a quick nap and I took a tour of the Capitol. Have you figured out which one of us values sleep more? Austin has an amazing group of local writers and illustrators, many of whom I've met at various SCBWI conferences. It was wonderful to see Jessica Lee Anderson, Varian Johnson, Jeanette Larson, Cynthia Leitich Smith, Greg Leitich Smith, and Don Tate at BookPeople that evening. We were even given a Texas-sized donut (which I ate after Carolyn went to sleep)! Early the next morning, we finally flew to my side of the United States, driving straight to a speaking engagement at Chino Hills High School. That was followed by a presentation at Ayala High School. Then Carolyn took a quick nap (who would've thought!) while I watched TV and drank coffee. Yes, we each have our own ways of making sure we're sharp for evening bookstore events. Even though Carolyn and I have both been published for several years, we still get goosebumps when we walk into a store and see a nice display of our books, like the one at Mrs. Nelson's Toy & Book Shop. On our last day, Carolyn and I had brunch in Pasadena and reminisced about the past eight days. For two people who barely knew each other when we began writing The Future of Us, and had only hung out four times before this tour, we somehow managed to travel across the country for nine days without annoying each other once. And then we both quickly knocked on wood because we still had a full day ahead of us. First we spoke at Mayfield School. Then Burbank High School. When we were driving to B.H.S., we were told not to have any expectations. The school librarian had never brought an author to the school before, and the event was after school, so no one was required to be there. We could be speaking to just three people. But the place was packed! 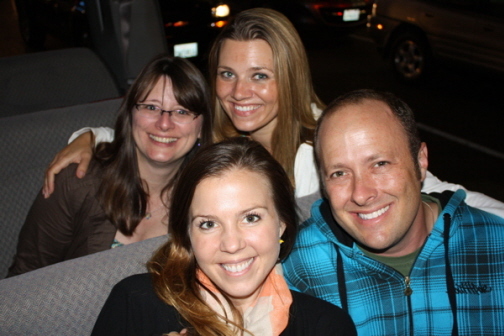 When Carolyn and I arrived at Once Upon A Time that evening, it was a mix of emotions. It was our last stop on the tour, and we were both ready to go home, but we were also feeling sad about parting, and sad that we won't be chatting with so many readers every day. When I walked into the store, I immediately recognized my friend Danielle, even though I haven't seen her since...seventh grade! The audience included some of my favorite authors. Lisa Yee is circled in yellow, Ned Vizzini in blue, and that's either Ben Esch or Greg Pincus in green (they're both rather fuzzy). With the final speech given, and the final book signed, Carolyn and I wilted. But someone wanted us to pose for one final end-of-tour photo. I don't think I've ever flown into and out of a state in the same day, but that's what Carolyn Mackler and I did in Florida. But between flights, we had an amazing time. The weather in Coral Gables was perfect, so we took a stroll through downtown. Instead of shopping, we chatted about the books we're each working on. We may not be co-writing these books, but we're still bouncing ideas off each other. The moment we announced our tour dates, other authors began telling us how much they love Books & Books. And it is a wonderful store, with an amazing cafe. And once again, a lovely reader made my tummy very happy by bringing me donuts. They were, without any exaggerating, the best donuts I've ever had. The photo I took of them was blurry, and they didn't last long enough to take another photo, but I need to say a very special Thank You to Crissa for the delicious gift. While Carolyn and I were speaking, I didn't notice the photography books with partially nekkid ladies over my shoulder. No wonder the audience was paying such close attention! After that event, Carolyn and I hopped on a late flight to Houston, Texas. 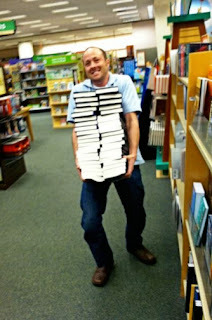 In the morning, we drove to every bookstore we could find, hunted around for our books, and signed them. On one hunting expedition, I heard Carolyn calling for help. 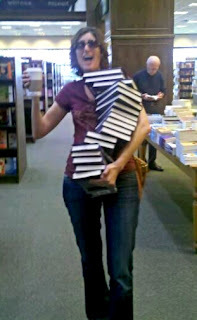 She had coffee in one hand, and a stack of slowly sliding books in the other. But before I came to her aid, I took a photo. 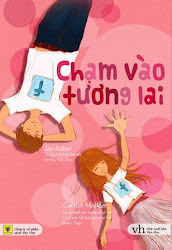 In the afternoon, we spoke at Blue Willow Bookshop. Every time we enter a store and see a nice display of our books, we both tilt our heads and sigh. And then people show up, and we tell them about how we wrote The Future of Us, and we answer questions, and we autograph books, and Carolyn and I look at each other, feeling so thankful for all of our readers. And then, at the bookstore we found on the way to the airport, she got me back. On our third stop as we move across the country to talk about The Future of Us, Carolyn Mackler and I spoke at the Bethesda Library in Maryland. Politics & Prose supplied the books, which is the coolest name for a bookstore based in Washington D.C. When we weren't at the library, Carolyn and I were driving from bookstore to bookstore, signing whatever they had in stock. So if you live in a city we're visiting on this tour, but you can't make it out to see us, there's a good chance several places in the area have signed copies of our books. The next morning, Carolyn and I were up at 4am to fly to Georgia. 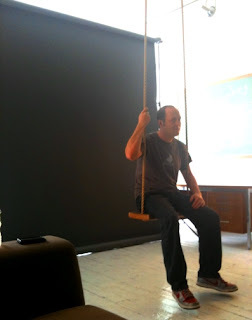 There, we spoke at The Galloway School. It was our first time speaking at a school together, so we had to take a photo by their marquee. And then Carolyn had to pull out a plastic spoon to scoop some Georgia soil into a baggie. She's collecting soil from each state we visit for her son's school project. She's such a good mommy! But we had a wonderful time! In one part of our presentation, Carolyn and I talk about editing The Future of Us, and we share four versions of the opening sentences to our book. 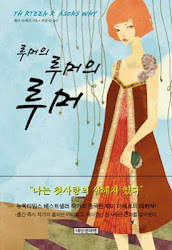 When we read the final version, the students began to laugh. But we didn't understand what was so funny about "I can’t break up with Graham today, even though I told my friends I’d do it the next time I saw him. So instead, I’m hiding in my bedroom, setting up my new computer while he plays Ultimate Frisbee in the park across the street." And then they pointed out a student named Graham who plays Ultimate Frisbee. In the evening, we spoke in the loft at Little Shop of Stories, a beautiful store in Decatur. They had the best wall art! In attendance, we were lucky enough to have Jessica Khoury, who has a book coming out with Razorbill this October. So she's basically our sister! 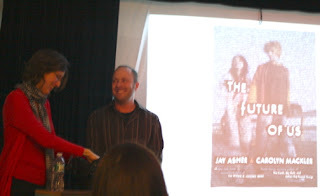 Our first stop on the book tour for The Future of Us was at Barnes & Noble in Princeton, NJ. The next day, I took a quick trip to The Metropolitan Museum of Art. I only had about two hours, so I rushed through the new exhibit of American art, which prominently featured Washington Crossing the Delaware. That thing was huge! And I'm still a little disbelieving whenever I stand before a piece of art that almost everyone knows about. This can't be the real painting. It must be a copy! Before I rushed back to my hotel, I took a close-up photo of one soldier from On the Southern Plains, by Frederic Remington. For some reason, I was mesmerized by his expression. At first, it made me laugh. Then it freaked me out! Even though the tour's barely begun, I miss Isaiah tremendously. And apparently he's been missing our reading time, so we scheduled a Skype chat. I read him Nina Laden's Grow Up! while he flipped the pages. And then he hit a couple of buttons and the screen went blank. For our next stop on the tour, Carolyn and I went to WORD in Brooklyn. 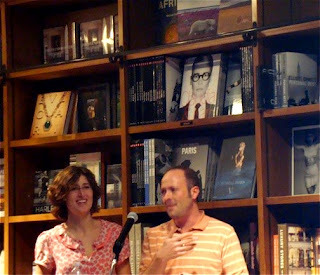 They have a great downstairs room for author events, so Carolyn and I were able to debut our funky/cheesy/cool Powerpoint presentation, which includes photos of what we each looked like in high school, and what we both look like in heart-covered tights. 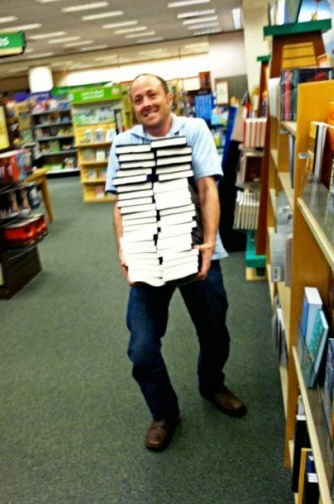 Of course, the best part of speaking at bookstores is meeting readers. 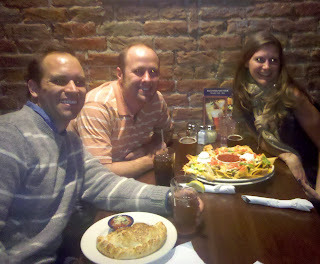 Some readers I've known through the blog/Facebook/Twitter for years and it's great to finally meet face-to-face. For example, in Brooklyn, I met Nicole. 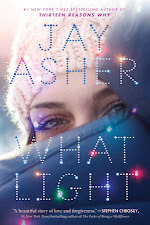 She created one of the first mock Thirteen Reasons Why movie posters that appeared online after the movie deal was announced. She printed out a small version, hoping that maybe I'd remember. I did, of course! And she was kind enough to autograph it for me. Carolyn Mackler and I will be visiting 9 cities over the next 9 days to talk about The Future of Us. Hopefully you can make it to one of these stops! Since we're starting on the East Coast, I caught a flight out of California Monday morning and arrived in New York in the evening. With only enough time for a late dinner, I went out for pizza with local designer, artist, writer, and activist, Asher Jay. Yes, you read that right. Her name is Asher Jay! Asher Jay first heard about Jay Asher (that's me!) while shopping at a Duane Reade Drugstore. They weren't selling Thirteen Reasons Why at the store, but someone who'd just been there accidentally left his/her copy of the book on the counter, which is where Asher Jay noticed it. And two years later, we're sharing a pizza! My fingers are crossed that we'll run into some guy named Mackler Carolyn in California. That would bookend this tour beautifully! On Friday, I attended the opening day ceremonies at Cuesta College, where I was given one of four Honored Alum awards. Not only was it wonderful to be recognized, but it felt so beautifully significant because, if not for attending Cuesta, I may have never decided to become an author. 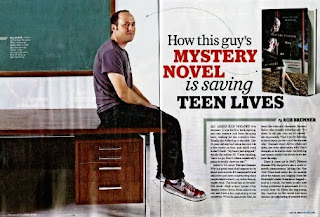 If you look on the acknowledgements page of Thirteen Reasons Why (13 Inspirations), you'll notice the thirteenth mention says "Nancy Hurd - the reason I wrote my first book...thirteen years ago." Ms. Hurd was my Children's Literature Appreciation teacher, and it was in her class that I wrote two picture books for my final project. That's where it all began. Ms. Hurd nominated me for this award, and sat in the front row as I received it. So once again...Thank you! Here I am with the other honorees during our tour of the campus. From left to right are the parents of Marin Pilloud, me, Dee Torres, and Michael Thibodeaux. 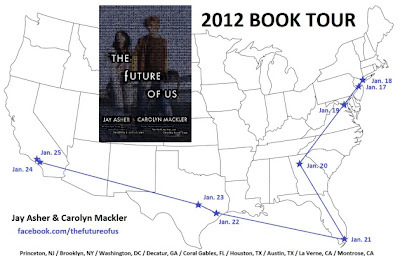 Beginning next week, Carolyn Mackler and I will travel to 9 cities across the country in 9 days to talk about The Future of Us. Most days will be filled with travel, speaking, and signing books, but there will be a few hours here and there to check out the sites. If you currently live, have ever lived, or spent some time in these cities, I want to know what you think is a can't-miss. Since time will be limited, I'm mostly interested in two things: food & art. Are there nice restaurants where the food will make my eyes roll back? Or cheap and delicious spots where a dollar will go a long way toward filling my tummy? Either way, I'm already getting hungry! Are there museums I can pop into for a quick stroll that'll make my eyes and brain dance for joy? Or maybe make me smarter? I waited until it was officially 2012 to write this post, just in case something amazing happened in the final moments of 2011. Instead, I got the flu. Doing a photoshoot for Entertainment Weekly. Opening a box to find copies of my second book. Taking my niece and nephew backstage at a Selena Gomez concert. With some of my SCBWI friends, surviving one of the most terrifying nights of my life. What happened? Hmm... Maybe one day you'll read all about it! Having lunch with some of the Penguin people most responsible for bringing The Future of Us into the world. And during lunch, getting a call that Warner Bros. made an offer on the movie rights. My family having dinner with Carolyn Mackler's family, and seeing our three boys sitting on the couch together. Truly, the future of us. Getting to drink a rootbeer in the spot where Charles Schulz (creator of Peanuts...duh!) spent much of his childhood. His dad owned a barbershop downstairs and the family lived upstairs. Sparky (his nickname...duh!) was a huge creative influence on me. Traveling to speak in cities that allow me to reconnect with friends.